Lake District holidays conjure up images of sweeping hills, craggy peaks and glistening lakes. Book a Lake District hotel for landscapes that have inspired writers and artists for centuries. Whether you’re headed to the Lake District to hike wildflower-shrouded fells and mountains, or to bike and pony trek across mountains and woodlands, this is one of England’s most outdoorsy areas. Yet it’s also a spot for quaint vintage charm, with homely tearooms serving up tea and cake all year round. Whether you fancy spending cold rainy nights nestled by the fire while supping on a pint of local ale, or prefer to while away evenings tapping your foot to local jazz or indie bands, nightlife and entertainment in the Lake District is vibrant and varied. In summer you can head to a beer garden to enjoy an evening drink in the fresh night air. The Lake District is an outdoor playground for families, overflowing with wistful woodlands, meandering mountains, and of course those shimmering lakes, all waiting to be explored. Once you’ve adventured all you like, there’s still plenty to discover in child-friendly indoor attractions, too. It’s no wonder England’s most scenic area is choc-full of cultural attractions. The craggy mist-swathed limestone fells, zig-zagging stone walls, and glassy mountain-reflecting lakes have long been inspiration for poets, artists, and novelists. Here you can spend days discovering grand homes, intriguing museums, and gallery-filled lakeside villages. 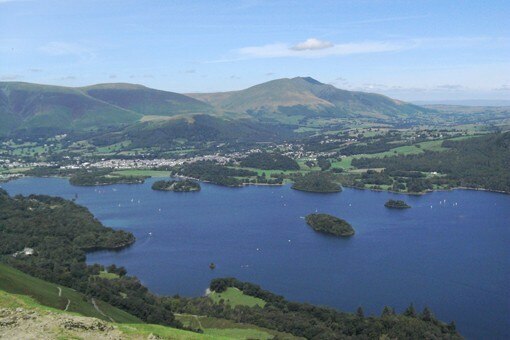 The Lake District represents the glorious best of the great British countryside. Whether you’re exploring on foot, touring the landscape on two wheels, or simply pottering around and pretending to be Wordsworth, it's a blissful escape from the cares of contemporary living. And, as you'd expect from one of the UK's perennially popular destinations, there are plenty of top-notch hotels and guestrooms to meet your every need. While the Lake District is known worldwide for its majestic mountains, sky-blue waters, and sprawling woodland, it might not have quite the same reputation for shopping. But if you’re planning a trip, you can rest assured that throughout the lakes you’ll be able to browse local wares as well as sightsee. From charming tokens to adorn your walls and windowsills to tasty treats to savour later, you’ll leave well stocked and thoroughly satisfied. For centuries the Lake District has been a favourite muse of writers, artists, and visionaries, with poet William Wordsworth famously describing the landscape as the "loveliest spot that man hath ever found". With swathes upon swathes of sprawling pastel-green valleys, glorious lakes, and hypnotic woodland, the national park is a playground of dreams for adventurous, outdoorsy types and anyone else with a taste for the best that nature has offer. Home to Wordsworth, Coleridge, and Beatrix Potter at various points in their lives, it’s easy to see why the Lake District has inspired such a vast and beguiling treasure trove of beloved literature. From rolling hills decorated with intricate woodland to crystal lakes shimmering in the softest breeze, it’s a landscape like no other – perfect for those looking to explore the great outdoors, feast on the best game around, and take home a quirky keepsake. The ravishing Lake District countryside has entranced adventurers, poets, artists, and just about everyone else lucky enough to set foot in the region. This dramatic emerald haven also boasts some of the UK’s most distinct and refined dining establishments. With access to top-of-the-range local produce, you’ll find fresh English fare at its very best, whether you’re tucking into a juicy cut of venison or a soft and salty fillet of bream.